Smoothies aren’t just a fantastic way to cool down on warm summer days, they are little rockets full of nutrients that can help to keep kids healthy and help them to grow “big and strong”. Some smoothie recipes, however, are not geared toward children. Bitter vegetables may elicit a face of disgust from even the most adventurous little eater. There are, however, several healthy and nutritious recipes that will appeal to both you and your children. In fact, they just may not stop asking for these. So, get out your blender, and let’s get mixing! 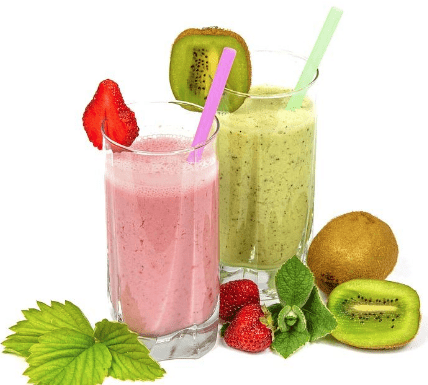 If your household is a madhouse in the morning, smoothies are a perfect way to provide a nutritious breakfast for your kids without sacrificing much time. Keep your kids awake in school with these delicious day starters. Triple berry smoothie – Blend 1 cup of a mixture of your child’s favorite berries with 1 cup of yogurt, 2 bananas, and some crushed ice. The fun, vibrant color, and berry-sweet flavor appeals to kids of all ages. Papaya smoothie – Blend one (peeled) papaya with ½ cup of pineapple chunks, a splash of coconut extract, 1 cup of yogurt, and some crushed ice. The papaya in this smoothie is full of nutrients, and the fun, orange color is irresistible. Arguably the healthiest, most nutrient dense type of smoothie out there, green smoothies incorporate leafy vegetables like kale and spinach. If you thought getting your kids to eat their greens was an impossible task, give these smoothies a try. Kale Banana Smoothie – Blend two cups of kale, one banana, 1 teaspoon of maple syrup, and ½ of soy milk in a blender. If the green color throws your kids off, tell them it is a monster smoothie or another creative name that will appeal to them. Spinach and Apple Smoothie – blend 1 cup of spinach, ½ an apple, 1 banana, 1 cup of grapes, and some vanilla yogurt in a blender. The sweetness of the apple, banana, and grapes work wonders to cover up the bitter flavor that frequently turns kids away from spinach. Kale and spinach aren’t the only vegetables that get to shine in smoothies. Other vegetables also have excellent nutritional value and blend well with fruits to create an irresistible and healthy treat for kids. These recipes are sure to be a hit with your kids. Carrot Orange Smoothie – Blend ½ cup of diced carrots, 2 peeled oranges, 2 tablespoons of goji berries, 1 cup of coconut water, and a handful of ice cubes in a blender. This smoothie is chock full of Vitamin C, Vitamin A, Vitamin B6, and dietary fiber. As always, the fun orange color is sure to be a success with young kids. Blueberry Beet Smoothie – Peel and dice two beets and one apple. Add these into a blender with a cup and a half of blueberries, plus a splash of water. For an extra tangy kick, add a tablespoon of grated ginger. While these may not sound like kid-friendly ingredients, the deep purple color is sure to lure them in. Just don’t tell them what vegetable you used! Still Can’t Get Them to Bite? Get your kids excited about smoothies. Make sure that you involve them in the process of making them. You can have them pick which fruits they would like it, and offer them an ultimatum: only if you drink it. Young kids will appreciate being allowed to hit the pulse button on the blender, just make sure to keep an eye on them. Slowly transition them. If your kids like milkshakes, you can work to get them off the sugar and onto healthy fruits and vegetables. Let them add chocolate, peanut butter, or other fun flavors. Gradually cut down on the number of additional sugary ingredients until they enjoy the smoothie itself. In the summer, frozen smoothies make for great popsicles. Simply pour the smoothies into small cups, cover with plastic wrap, stick a popsicle stick in, and freeze. Kids love flavored fruit popsicles.